Eye Pressure Control is an essential natural formulation for maintaining eye health and preventing age-related deterioration of the eye’s vascular system. It consists of two completely natural, patented extracts - Mirtoselect®, an extract of bilberries harvested from European forests, and Pycnogenol®, an extract of maritime pine bark, from the Landes de Gascogne in France. Who is Eye Pressure Control aimed at? those with a family history of glaucoma, cataract and AMD. those looking for natural ways of preventing or minimising the risk of age-related eye problems. those keen to preserve their visual acuity. those wishing to give their visual performance a temporary boost. those suffering from diabetes or hypothyroidism. those with either low or high blood pressure and those with existing heart problems. those with existing eye problems (myopia, diagnosed cataract, chronic uveitis, etc.). those who’ve suffered a major injury to the eye. MirtoSelect® is an authentic bilberry extract (Vaccinium myrtillus) standardised to 36% anthocyanins. It is obtained exclusively from fresh bilberries harvested when ripe, between July and September. combat ageing of the eyes. We now know that these benefits are due to the berries’ anthocyanin content. Anthocyanins are found in many fruits, in some root or leafy vegetables and in red wine, but it is bilberries which are the best dietary source (7). Part of the large flavonoid family, anthocyanins are antioxidant compounds exclusive to the plant kingdom. Powerful antioxidant activity. The anthocyanins in bilberries are potent antioxidants which like all vitamins for eye health neutralise reactive oxygen species, particularly superoxide anion (O2-), and reduce lipid peroxidation (8), a process which encourages fatty acids to turn ‘rancid’. Anthocyanins can prevent light-induced photo-oxidation, particularly that involving lipofuscin (9), a pigment that accumulates over time in the cells of the retinal epithelium. This oxidation itself generates phototoxic free radicals, leading to chronic oxidative stress which is particularly harmful to the eyes (10). However, this process too can be stemmed by anthocyanins. Anthocyanins also appear to increase ocular levels of endogenous antioxidants (ie, those made by the body), such as glutathione, vitamin C and superoxide dismutase (11). Anti-inflammatory properties. Recent studies show that anthocyanins can halt the expression of genes which contribute to inflammation, and instead encourage the expression of those that fight it (12). This is a particularly useful property since inflammation is thought to play a role in many diseases, especially atherosclerosis, a major risk factor for glaucoma. Inhibition of phosphodiesterase. The anthocyanins in bilberry (cyanidin, delphinidin and malvidin) slow down the activity of an enzyme which is very active in the eye called phosphodiesterase (13). This enzyme is responsible for inactivating a cell messenger which stimulates neurons and increases the brain’s glucose supply. By inhibiting phosphodiesterase, anthocyanins thus provide a temporary boost to this messenger, resulting in stimulation of neurons and photoreceptor cells. This mechanism partly explains the improvements in visual acuity observed in studies and empirical data among those who consume bilberries and bilberry extracts. Effect on arterial vasomotricity. Vasomotricity is the ability of an artery to modulate its size. It’s an essential property for healthy blood flow but one which can often be impaired by the formation of fatty deposits on the inner lining of blood vessels. These vessels then find it harder to respond to biochemical signals and gradually deteriorate. Anthocyanins may thus have a positive effect on this property which is directly involved in visual function (14). Note : ‘bilberry’ refers solely to the shrub known scientifically as Vaccinium myrtillus, while ‘blueberry’, which is often used as a universal name for blue-coloured berries, is a cultivated hybrid of several American species. The latter’s pulp is greenish in colour, while that of bilberry is blue. 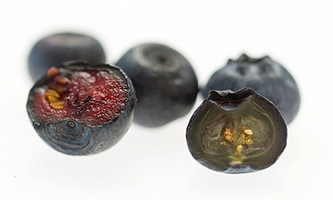 Bilberries are juicier than blueberries, and have a far higher content of anthocyanins. Bilberries are undoubtedly the most precious of the berry species: they are extremely difficult to cultivate and much more delicate than other berries (making them more susceptible to damage and difficult to transport). The bilberries used for this extract are thus harvested from wild plants before being frozen, sorted, cleaned and then purified in a way that preserves all their active substances and guarantees optimal efficacy of the fruit’s anthocyanins (15). Pycnogenol® is an extract of maritime pine bark (Pinus pinaster) with a standardised content of proanthocyanidins or oligoproanthocyanidins (OPC), a group of antioxidant compounds found in certain plants. Thanks to the work of Jacques Masquellier, we now know that it was the proanthocyanidins in pine bark which cured the crew of Jacques Cartier’s ship, ice-bound for several weeks on the St. Lawrence river. They were suffering from a mystery disease not known at that time: scurvy. As a result of almost 160 clinical studies and 420 research papers, we now have a better understanding of the proanthocyanidins in pine bark and their effects on the human body. These compounds play a beneficial role in blood vessel walls, encouraging them to dilate. This is an important function since defects in the blood vessels that supply nutrients to photoreceptors and cells of the retinal pigment epithelium are a factor in the most common sight problems. These defects result in hypoxia which triggers the release of substances that contribute to the development of vision problems and lead to a cascade of reactions harmful to visual function as a whole. In most cases therefore, glaucoma is the result of insufficient blood reaching the optic nerve, related to atheromatous plaques present on the walls of the blood vessels supplying this nerve. 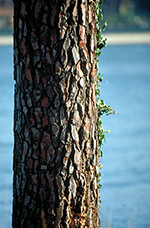 Pycnogenol® is produced from the bark of a unique species of pine that grows exclusively in the Landes de Gascogne in south-west France. No pesticides or herbicides are used and all felled trees are replaced, as required by French forestry law. Why are the eyes subject to so much oxidative stress? Of all the body’s tissues, it is the retina which undergoes the greatest regeneration. .This inevitably involves constant production of free radicals. In addition, the retina is particularly exposed to the sun’s UV rays which themselves generate potentially harmful free radicals. Although these free radicals are targeted by both endogenous and exogenous antioxidants, some slip through the net and manage to damage the body’s cells, proteins and fatty acids. Highly-concentrated in eye cell membranes as well as in photoreceptor cones in the macula, polyunsaturated fatty acids (PUFAs) are particularly vulnerable. Over time, the micro-damage caused by free radicals accumulates and causes ageing of the eyes and numerous functional problems. The rate of deterioration depends on the extent of free radical generation (which in turn depends on several lifestyle-related factors), as well as the amount of vitamins for eye health and other antioxidants provided by the diet: the lower the intake of these valuable compounds, the more likely these free radicals are to slip through. A persistent imbalance between free radical production and antioxidant defences is referred to as oxidative stress. It manifests in structural and functional changes and is a key factor in the development of eye diseases (16). Ensuring good nutrition for eye health in the form of an adequate intake of exogenous antioxidants such as anthocyanins or proanthocyanidins is therefore an excellent way of preventing this vicious circle from developing. For these antioxidants to succeed in reaching the structures of the eyes, it’s also necessary to ensure optimisation of the retinal vascular network: the functional integrity of photoreceptor cells depends on healthy retinal capillary function – and not only for the circulation of antioxidants. Photoreceptors require significant levels of oxygen and constantly produce large amounts of waste products which need to be rapidly eliminated to prevent a deterioration in photoreceptor function. In the absence of such conditions, there’s a risk that diseases such as glaucoma and AMD will develop rapidly (22). Can Eye Pressure Control be combined with other supplements? The eye has a hydrolipid barrier: it therefore needs to be supplied with water-soluble antioxidants such as anthocyanins, as well as lipid-soluble ones such as carotenoids, in order to protect the PUFA-rich retina. Lutein, zeaxanthin and meso-zeaxanthin are the three carotenoid pigments most highly-concentrated in the retina: they’re also responsible for the macula’s yellow colour. 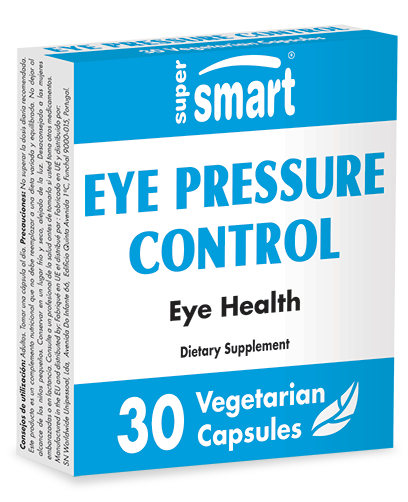 Eye Pressure Control combines very well with Lutein 20 mg, Smart Eyes or Macula Plus, a top of the range formulation with a high carotenoid content. Are there any other measures that can be combined with taking Eye Pressure Control? Avoid using corticosteroids in the form of eye drops or oral solutions. Prioritise nutrition for eye health by eating a diet high in fresh fruit and vegetables. Reduce your intake of caffeine and don’t smoke. Take regular exercise, avoiding activities which are overly intensive and yoga postures and exercises that involve lowering the head as this can increase pressure in the eyes. Protect the eyes from the sun’s UV rays by wearing sunglasses that filter out 100% of UV light. When should you take Eye Pressure Control? To prevent any stomach problems, Eye Pressure Control should ideally be taken with, or just after, food. Mirtoselect®, Indena, Italy. Pycnogenol®, Horphag, Switzerland.